Ad Konings met en garde contre la disparition, malheureusement annoncée de ce Tropheus. Re: De la disparition annoncée d'une variété ? Une vidéo qui permet de savoir où ils sont allés. Elle est privée ... on ne voit donc pas où ils sont partis. Pour ceux qui sont sur FB. On the fast track to extinction? The small population of Tropheus moorii “Murago Tanzania”, discovered in 2008, was found by commercial collectors in 2014, when the collecting of this Tropheus variant commenced. Announcements addressing the fragile nature of this small population were published on several occasions to inform importers and hobbyists alike (Karlsson 2012, 2014a,b; Konings 2014). Sadly, it seems that collections continue of T. moorii “Murago Tanzania”, and exports are repeatedly containing the fish. We fear that the population is already seriously diminished and may well have met a viable point by now, with the risk of the loss of genetic variability due to the low number of individuals remaining. With less genetic variability, the population may lose its virility, reduced fertility, and become more vulnerable to genetically related problems. In the long term, a small population with less genetic variability is less likely to respond to selective pressure and more likely to become extinct. In the short term, a small population will be more vulnerable to diseases and parasites than populations with a greater gene variation. This applies at the individual level as well, because with fewer individuals the risk of inbreeding increases, with the result being a higher number of individuals potentially having two defective copies of a particular gene. The risk of literally wiping out the entire Tropheus population is also imminent by the collecting of the major part of the population, leaving the remaining individuals to harsh competition by other species, predators, and with major difficulties to find a mate. Obviously, there are no reasons to discuss the aspect of inbreeding and genetic loss when the whole population is gone. Several authors (Ad Konings, Livio Leoni, Benoît Jonas, Hans-Georg Evers and Wolfgang Staeck) have contributed to the conservation of this unique and highly threatened Tropheus variant (see reference list). Also importers are taking a stand against the trade with wild “Murago Tanzania” (Steve Ewald and others). A very fresh report from an individual Tanzanian collector says that it now seems that most adult individuals of “Murago Tanzania” are gone from the habitat. There are at least six ‘companies’ collecting “Murago Tanzania”. 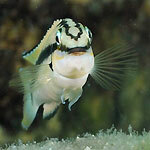 When collecting, the entire small habitat is repeatedly swept over while searching for the fish. Collectors are now collecting even on the fringes of the area of distribution, where the fish is extremely scares due to suboptimal habitat and where the pattern of colours, stripes and spots are increasingly faint. Please do not purchase wild Tropheus moorii “Murago Tanzania”. Bred fish from already imported wild individuals or fish bred at the lake should soon be (and perhaps already are) available from breeders/dealers. Let us hope that the report from the Tanzanian collector is not entirely correct, and that there still are enough individuals (sub-adults and juveniles) in the habitat for the population to be able to recover from recent collections, though we fear that the population of "Murago Tanzania" may already have reached a minimum viable population size. Karlsson, M. and Karlsson, M. (2012) Tropheus moorii “Murago”. Ciklidbladet, 45 (2): 6-15. Nordiska Ciklidsällskapet. Ward, P. (2004) The father of all mass extinctions. Conservation in Practice, 5 (3): 12–17. Caption: Tropheus moorii "Murago Tanzania", female in its natural habitat, depth 5 metres."